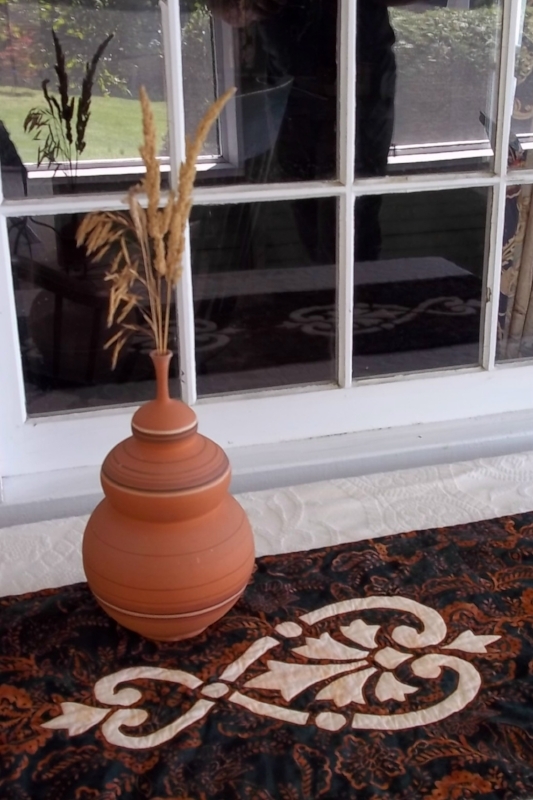 Hearts & Fleurs table runner (13" x 36") A beginning pattern created with graceful inside and outside curves and circles. Welcome to our final blog, Part 5 of our 5: Curves & Circles, in our series on Machine Reverse Applique. The goal when satin stitching a curve/ circle, is to keep the threads of the satin stitch perpendicular to the raw edge. You want your stitches evenly spaced with no gaps on the outside edge. I always stitch with my needle in the needle down position. Whether you leave the needle down in the right or left of the satin stitch depends upon which way you are curving. I stitch using my open-toed foot so I can see where I'm going. I find the size of the circle and the sharpness of the curve determines whether I stitch continuously as I slowly turn my piece, or whether I stop, slightly pivot, and then begin again. I look at my piece as the steering wheel of a car, with my hands positioned at opposite points on the "wheel". My presser foot is my gas pedal. How fast I turn the "steering wheel" and how much "gas" I give the pedal depends on how sharp the corner is or how big the circle is. Illumination, Medallion X (36" x 36" reverse applique medallion or 56" x 56" with applique border) Lots of inside and outside curves, and circles of various sizes. The smaller the circle or tighter the curve, the more I stop, pivot and stitch. Essentially I stitch straight for 2 +/- stitches, stop and pivot ever so slightly. Stitch again and repeat. For medium to large circles and broader sweeping curves, I usually stitch continuously, but sometimes start and stop as I do for small circles. For continuous stitching, I'm coordinating the movement of my hands and arms turning the piece in relation to the arc and the sound of the speed of my sewing machine. I turn my piece steadily, slowly and smoothly until I need to re-position my hands. I stop with the needle in the down position, re-position my hands and stitch again. Take note that all reverse applique circles are inside curves. Therefore the same steps apply stitching circles as well as inside curves..
Let's review: To begin, I align my presser foot so the middle notch is just to the right of the raw edge, and the opening of the presser foot is perpendicular to the raw edge. When my needle is in the left position of the satin stitch it will be in my background fabric next to the raw edge, and the right position of the satin stitch will be in my top fabric. Every time I stop, I will want my needle down in the right side of the satin stitch, which will also be in my top fabric. Center notch of open toed foot presser foot aligned with raw edge. Left hand needle position of satin stitch in my background fabric right next to the raw edge. Background fabric is on my left as I sew. Right hand needle position of the satin stitch is in my top fabric. Top fabric is on my right as I sew. For tight inside curves and circles I use a stop and start system. Close-up of a small, tight circle. I stitch straight for 2 +/- stitches, end with the needle down on the right, pivot my fabric ever so slightly so the presser foot is again perpendicular to the raw edge, and sew again. You may notice as you are sewing that the left needle position gets closer to the raw edge of your circle/ curve. When its next to it, its time to stop with your needle in the right position and pivot again. Once you begin stitching, the left side of the satin stitch will overlap what you've already stitched on the inside edge of the curve. On the outside edge of the inside curve, the right side of the satin stitch, there will be no gaps in your stitching. 1. Sewing 3 +/- stitches. End in right hand side of satin stitch, on the outside edge of the inside curve/ circle. Notice how the stitches on the left hand side of the satin stitch are butting up to the raw edge. 2. 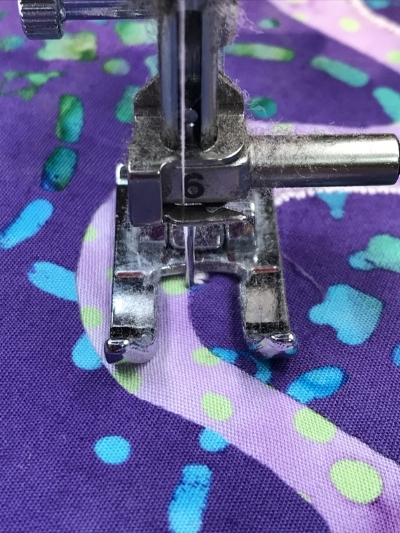 After pivoting, ever so slightly, to the right, your presser foot is again perpendicular to the raw edge and you are ready to sew another 3 +/- stitches. 3. After stitching another 3 +/- stitches end with needle in the right hand position of the satin stitch. 4. After pivoting, ever so slightly, to the right, so your presser foot is perpendicular to your raw edge. Majesty medallion IX (36" x 36") under my machine: a quilt steering wheel. Left hand placed for driving around the corner. The right hand, which should be at 4 o'clock, is holding the camera. If its a medium - large circle/ inside curve, I tend to stitch continuously at a steady pace, but sometimes use the start and stop system. To stitch continuously, I start with my hands opposite each other, equi-distant from my curve/ circle, which is centered between my hands. My left hand will be at roughly 10 and my right hand at 4. As I stitch I steadily pivot my piece as if I'm turning left around a corner, keeping the left position of the needle in the background fabric and the right position of the needle in the top fabric. My circle/ inside curve edge is my pivot point. I stitch by feel and sound. I've gotten used to how my sewing machine sounds in relation to the pace at which I turn my piece. When I've turned my piece so my hands have gone from 10 and 4 to 8 and 2, I stop and re-position back to 10 and 4. I always stop sewing before re-positioning my hands with my needle down in the right-hand position of the satin stitch. If my needle stops on the outside of the curve my stitch work will have no gaps. If I don't arc fast enough or smoothly enough in relation to the arc of the curve, I will get flat sides and corners when I pivot. If I arc too fast, I will have gaps in my satin stitch on the outside of the curve. If I arc too slowly I may get a pile up of stitches. A GOOD inside curve. Stitches are even and arc smoothly. A NOT-SO-GOOD inside curve. There are flattened places, the edge is bumpy, and I have some soft corners. You can also approach stitching medium-large curves like small ones, with a start and stop system. Then you are more likely to stitch straight for 3 - 5 +/- stitches before stopping with your needle in the right position and pivoting slightly. You will just need to experiment. I approach stitching outside curves like I do inside curves. The arc of the curve determines whether I will stitch continuously or with the start and stop system. But now every time I stop, my needle will be in the left hand position of the satin stitch which is in the background fabric. This will assure that I have no stitch gaps on the left, the outside edge of the outside curve, and the stitches on the right side will overlap. If stitching with the continuous system my right hand will start at 2 and my left hand at 8, and I will stitch until my right hand is at 4 and my left hand is at 10. As I stitch I steadily pivot my piece as if I'm turning right around a corner, keeping the left position of the needle in the background fabric and the right position of the needle in the top fabric. When I stop to re-position my hands, my needle will be in the left hand position of the satin stitch. My outside curve edge is my pivot point. The pictures below breakdown the start and stop system for outside curves. 1. Time to pivot. I can tell because the presser foot is no longer perpendicular to my raw edge. I leave the needle down in the left hand position of the satin stitch, and raise my presser foot. 2. I pivoted my piece, ever so slightly, to the left, so my presser foot is again perpendicular to my raw edge. Lower the foot and sew 3 +/- stitches. The stitches on the inside edge will overlap, and the outside edge will have no gaps in the satin stitch. 3. Time to pivot again. Remember to leave the needle down in the left hand position of the satin stitch on all outside curves. 4. After pivoting my piece, ever so slightly, to the left, so my presser foot is perpendicular to the raw edge, I'm ready to lower the presser foot and stitch another 3 +/- stitches. 5. Outside Curve is done. I hope you have found this blog series on Machine reverse applique insightful and helpful. I hope you've had fun learning about its creative possibilities and ways to stabilize your piece. I hope you are more familiar with your sewing machine's capabilities and have increased your awareness about your Eye - Needle coordination as you machine reverse applique, and gained some tips for successfully satin stitching corners, acute points, circles and curves. Use what you've learned about machine reverse applique in this series to create a cute, St. Valentine's table decor set in the blog "Feel the Love with Snowy Hearts" . Directions tell you how to create 4 machine reverse applique place mats and 4 appliqued reversible napkins to decorate your table for February. Its a small, fun project that gives you the opportunity to gain proficiency with the machine reverse applique techniques presented in this blog series using Snowy Hearts table runner IX. 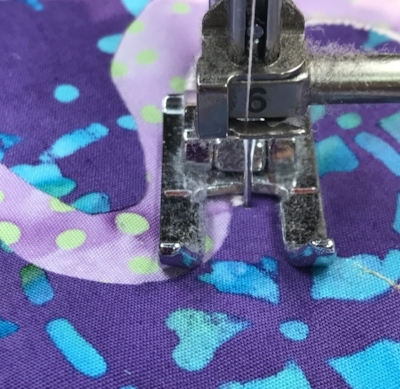 If you are just joining now, we invite you to go back and read Machine Reverse Applique Part 1 -Creative Possibilities, Part 2 - Stabilizing Your Fabric, Part 3 - Your Sewing Machine & You and Part 4 - Corners & Acute Points.